Mine began at my grandmother’s kitchen table – the place of Saturday night hamburgers, cookies and milk, folding clothes, accoutrements necessary for giving home perms, and crafts. When the crafts came out, the sponge in me soaked it all up. Her name was Amo (Ah-mo) and she was my little girl Sunday School teacher in addition to being my grandma. The best of both worlds! She loved to teach the children whether in song, story, or…felt. Who knew that felt could be so compelling? 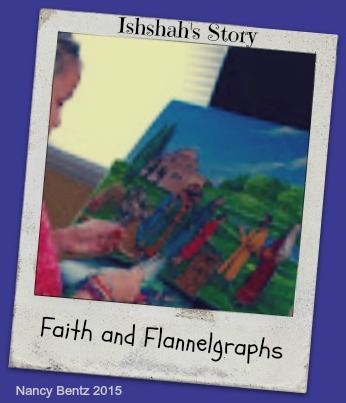 Bible stories came alive when she took to the flannelgraph board on Sunday morning. But it was the hours spent beforehand at her table spread with scissors, colorful paints and patterned pieces of felt that planted missionary seeds in my young heart. Being Caucasian, I identified with the little white children. Living in the Pacific Northwest where nearly every city or town has a Native American name (including the town where I grew up), it was easy to place the red children. Then there were the yellow ones, which in my young mind were from China (my mental globe hadn’t yet quite expanded to what it is today!). And finally, the little black children. How I loved the little black children. Even in felt, they were real people with real faces. And Jesus loved them, just like He loved me. That’s when I decided I wanted to go to Africa. When I was five, my family started attending a different church. These were formative years. The power of the Holy Spirit healed my frail body of epilepsy. At the same time, I sat in the pew and studied the big cork board with a map of the world. Yarn strings ran from pinpoints of assorted ‘foreign fields’ to photos of the missionaries called to those places. Some were married couples, others were brave single women. Somewhere in the five years since my grandmother’s kitchen table and her flannelgraph stories, the fear of leaving the known of home overrode my little person’s world view of red and yellow, black and white. At nine years old I was older and wiser and afraid. Africa was now just a dream. My grandmother died in February just a few weeks before my tenth birthday in early March. My flannelgraph days were buried with her. But like the kernel of wheat Jesus speaks of in John 12, more seeds were planted in the early years with her that only my later years are now seeing come to fruition. I love God’s unbidden reminders of things we may have forgotten that He has not. Close to forty years or so after my grandma’s death, I was eating with my husband in the food court of our neighborhood shopping mall. To this day I have no idea why the timing or the place (except that it was the mall’s kitchen) for Holy Spirit to show up, but He did. In a way that instantly reminded me of time spent with my grandmother’s flannelgraph board at her kitchen table. The second-story food court lines a length of the balcony overlooking the main floor of the mall. As I looked up I saw a woman a bit older than I was at the time walking toward me. She was black African, with gleaming dark chocolate skin and dressed in the most vibrant yellow and orange African dress and matching turban I had ever seen. What gripped me, though, was her dazzling smile directed solely at me as our eyes locked. Her entire face was beaming with the light of Christ. I knew in my spirit that she and I were to be connected somehow, someway. The only problem? She wasn’t there. I mean, she was. As real as my husband sitting next to me, but she was not there. She was a vision that lasted as long as it took her to walk the length of the tabled court to where we sat. Instinctively, I held her gaze until the vision faded away. I wanted to burn her into my memory, and it worked. Though the face of my grandmother, without the aid of old photographs, has grown fuzzy over the years, I can ‘see’ my black sister in Christ whenever I think of her, as clearly as I saw her that day. Over the decade or more since that vision, I have watched for her face in the crowd, that convinced I am that she is alive and real. If I never meet her this side of the Veil, I am expectant that we shall meet on the other side. When I began to write in the autumn of 2005, I didn’t have a flannelgraph board to tell my stories, nor a rapt audience around my kitchen table. What I did have was a lingering enjoyment of my high school English literature and creative writing classes. I could spell and type well, and I had a computer. The only place I knew to start was in writing what I knew: stories from my life; lessons learned in the journey; chronicles of my healing heart; and the faithfulness and love of the Lord Jesus through it all. It was a huge step of faith for me to begin writing; however, it was not long before it became my food of faith. Today, I write a lot. But even writers get tired and sometimes need a lift from others’ writing and testimony. There are more life stories to be told like these in Her Journey. Some of them belong to you. There are more expressions through poetry and psalms than just one can utter. More facets of artistry in painting, parable, and prose than could ever be contained within one vessel. Her Voice is for your voice. Her History and Her Wisdom offer yet other platforms of opportunity to share God’s greatness and treasure. Though I have never made it to Africa, I have the privilege through Ishshah’s Story of reaching many of God’s children around His world. Red and yellow, black and white. We are precious in His sight. How has He shown Himself precious to you? Will you join us and others to Tell the Story?